Inclui 2 horas de tempo livre no Pike Place Market - cuidado com peixes voadores! Esta introdução guiada às atrações imperdíveis de Seattle é ideal para visitantes que estão de primeira viagem. O dia começa com um serviço de busca no hotel por um mini-ônibus com ar-condicionado antes de se aventurar pelas principais atrações e pontos de interesse de Seattle e em torno da cidade. Há a famosa Space Needle (entrada incluída). Traga uma câmera para capturar vistas incríveis do Mt Rainier, das montanhas Cascade e Olympic, Puget Sound e do horizonte de Seattle. Seu guia experiente e amigável fornecerá comentários sobre a cidade. Viaje para a área de Lake Union, com várias casas flutuantes, incluindo a do filme Sleepless in Seattle. Passe pela Universidade de Washington e encontre a famosa escultura pública chamada Fremont Troll. Ballard Locks é uma das atrações turísticas mais populares de Seattle, especialmente durante os meses mais quentes. Depois, há a histórica Pioneer Square, o berço de Seattle e o "primeiro bairro" da cidade, com ótimos restaurantes, lojas, vida noturna e duas equipes profissionais. Visite também o Distrito Internacional de Chinatown, também conhecido como ID, um dos bairros mais antigos de Seattle. Em Belltown, o bairro mais populoso da cidade, fica o famoso Pike Place Market, um dos mais antigos mercados públicos de agricultores nos Estados Unidos. Pare para o almoço (por conta do visitante) e lazer e passe duas horas vagando e recebendo as vistas, os sons, os cheiros e os sabores deste notável mercado de 9 hectares. Os amantes do café também querem a experiência de parar no Starbucks original. Sinta-se à vontade para parar e sair em qualquer um dos locais ou atrações que pareçam especialmente atraentes. We couldn't believe all we got to see in one day. Lance was terrific! Learned tons of history but never felt rushed. a must for first timers. We had a great tour guide in Gary. He was very knowledgeable and friendly. 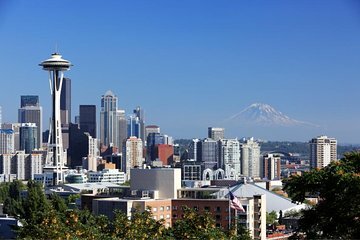 If you've not been to Seattle, this is a great tour to take. Very Excellent Tour and Guide (Dave). We only had one day in Seattle and this tour did a fantastic job of providing the most comprehensive taste of what Seattle had to offer. The amount of time at each stop was very well allotted. Highly recommend for those with limited time in Seattle. This tour was perfect. Nice small (13) group, knowledgeable driver, lots of time to explore sights of Seattle and get a flavor of the city.. ideal for a one day visit. Large buses take too long to load and unload so our bus size helped maximize our town. This was a great experience for my family and friends. Several family members were on canes and could not walk long distances. The bus was comfortable and our tour guide very knowledgeable of the city. The guide was helpful and courteous. This was an awesome tour with an even awesome tour guide. The view were extraordinary on this day so looking at Mt. Ranier was very clear. Loved the Space needle but I think about all I liked the little things I saw like hearing about the history of The Panama Hotel or finding out about the Stalin statue and why it was there. Pikes Place is always awesome. Loved every minute of the tour. This tour was excellent. Betsy was wonderful, knowledgeable and friendly. She communicated clearly, with extra special care to her passengers. If you have one day before cruising I would recommend this tour. The highlight was visiting the Space Needle and the Public Market place. We just needed an extra hour! The trip was a little longer ( 7 vs 6 hours) than expected due to traffic and events going on in Seattle in the Sunday of our tour. The driver was very knowledgeable of Seattle history and was very courteous and thorough. Very informative. Ron was very knowledgeable. Wished that Chihuli tour was included in tour along with the space needle. Enjoyed going through the different neighborhoods on the way to Ballard Locks. Wished we spent more time there.